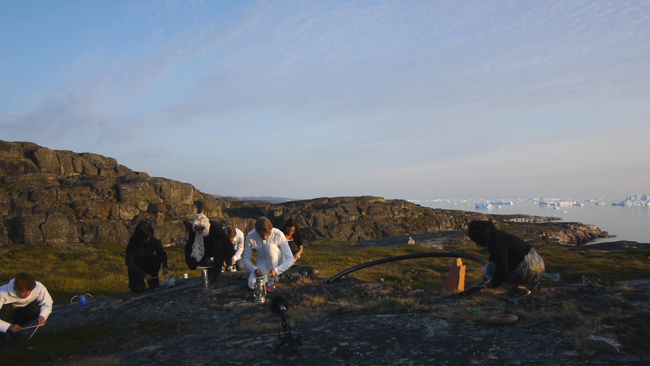 ICE’s Phyllis Chen and Ross Karre organized a site-determined version of Alvin Lucier’s Opera for Objects against the backdrop of the arctic horizon near Ilulissat, Greenland. The metronomic rhythm served as an arresting reminder of the ticking timer of arctic glaciers, currently melting at unprecedented rates. It’s a question we’ve been asking from the very first brainstorming sessions for the Ojai Festival programming and production. Whether it’s the Libbey Bowl presentations of intricate sequences of Boulez, Varèse, and Xenakis or the works of John Luther Adams in the park, every program must ask the question. For Anna Thorvaldsdóttir’s In the Light of Air, ICE specifically encouraged Anna to make a piece which would be redefined in each new space. In Ojai, we will install her work in the intimate Zalk Theater such that its doors which overlook the valley become a dramatic lighting design element. It will be a sublime juxtaposition of piece and place! But it is in John Luther Adams works where I find I have the greatest curiosity about this relationship. In 2009 I had the great fortune of working with John on the premiere of his Inuksuit in the Banff National Forest. On the heels of his experiences with Rob Esler in sites in the southern California desert and the Alaskan Tundra, Steven Schick asked John to create an outdoor percussion work which has since been performed and recorded in dozens of sites around the world–from the Park Avenue Armory to Australia. While at Banff, John lead numerous discussions about the opportunities and perils of site-specific work. He even coined (or introduced to me) a term which I have since used to represent this type of context-based interpretation: site-determined work. I like that term because it implies that the nature of the work itself will be determined by site at hand and successive performance sites. In the case of Inuksuit and Sila, the site fundamentally determines two of the most important parameters in the piece: the distribution of the performers and the resulting balances of visual and auditory stimulus. But non-traditional site determination comes with doubts and pitfalls. To those in the sonic vicinity of the performance who are unaware of the event’s existence, how do they distinguish between John’s carefully crafted sonic phenomena and noise pollution? For the hiker enjoying the Banff National Park, how are they to know that the hand crank sirens aren’t a signal for the end of days? I guess the answer to both of these questions is, “they don’t.” And that’s a problem. But a bigger problem is humanity’s inability to garner an awareness, respect, and appreciation for their natural surroundings. For those experiencing these monumental works on the periphery of Ojai’s parks or the trails in Banff, the magic occurs as the works fade to reveal (and draw stark attention to) the greatest site-specific work ever created: nature and our ecosystem. It is in this reveal that John creates the greatest advocacy for the environment he loves so deeply. My own appreciation of nature has never been more intensely brought to the fore than in the moment when glockenspiel bird calls cross-faded with native Banff birds. I look forward to finding out what Sila will reveal about the central coast of California and the magic of the site of Ojai.